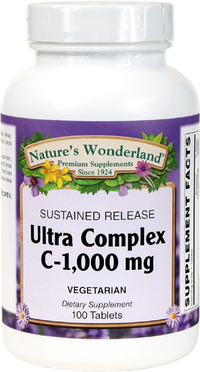 Vitamin C Ultra Complex 1000 mg - Sustained Release, 100 Vegetarian Tablets (Nature's Wonderland) - Penn Herb Co. Ltd.
Vitamin C is the popular antioxidant that helps neutralize harmful free radicals and reinforces immune health. 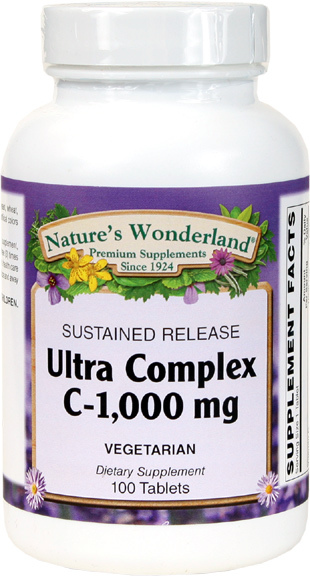 Our Ultra C Complex is enhanced with the additional antioxidant power of Citrus Bioflavonoids, Acerola, Hesperidin and Rutin. Vitamin C is quickly excreted from the body. Our superior sustained release formula gradually releases nutrients in the body for longer-lasting benefits. ”C” Your Way To Better Health All Year Long! Helps protect the body's cells from damage by free radicals generated during exposure to environmental stressors; supports immune system function; supports adrenal function (helps body manage stress). Involved in the production of collagen (a structural protein in connective tissue), and is therefore important for skin, bone & joint health; necessary for the utilization of many nutrients, such as folic acid and iron. As a dietary supplement, adults take one tablet, 1-3 times daily with meals, or as directed by a health care professional.